On December 24, 1902, Reginald Fessenden, who had previously engaged in experiments on the Outer Banks, made the first intentional wireless radio broadcast, playing his violin and reading a passage from the Bible. 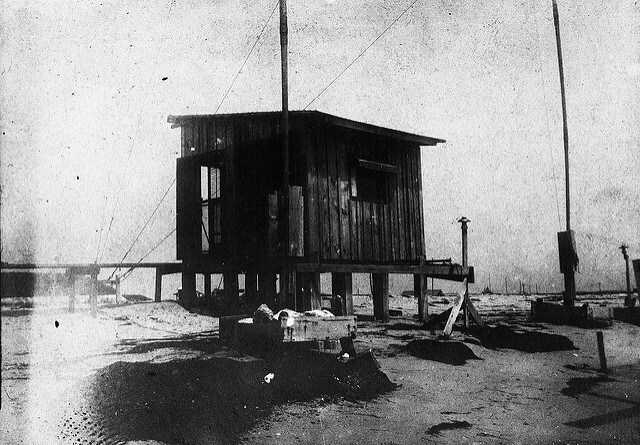 Fessenden came to North Carolina in 1900 under the auspices of the United States Weather Bureau to conduct experiments in wireless telegraphy on Roanoke Island. His two years’ work attracted considerable publicity. While in North Carolina, he transmitted the first varying musical notes. The 1902 transmissions were said to have been “very loud and plain” and as easy to understand as hearing sounds over an ordinary telephone. Relayed from Buxton, the broadcasts were received 48 miles north on Roanoke Island. The experiment station at Buxton no longer stands but the foundations for a tower used by Fessenden do remain. A prolific inventor, Fessenden patented more than 500 ideas, mostly in the field of radio. He is recognized as the originator of the continuous wave principle in wireless transmission. Fessenden died in 1932. The inventor’s papers, an enormous and varied collection spanning much of his working life, are housed in the State Archives of North Carolina.